The Richest Man in Assisi: Different Take on "A Mended and Broken Heart"
Different Take on "A Mended and Broken Heart"
Don't judge a book by it's cover -- that includes the inside flaps. Having finished Murray's "A Mended and Broken Heart," my opinion is differently changed from the original impression I gave back in November. This one is a different perspective than most biographies of St. Francis you'll find. It's easy to catch on to her skepticism at first glance. However, unlike those who suggest the Francis-and-Clare romantic connection simply to make them more "human," i.e. finding fault for its own sake, Murray sees an opportunity for sanctity. And to be clear, even the author doesn't expect her case to be convincing based on the evidence because the evidence is quite sparse. One really needs to think between the lines and -- perhaps more importantly -- consider the lesson she is drawing for all of us trying to find God while pulled by contradictory desires. The orthodox party line maintains that Francis and Clare shared no romantic bond. My understanding is the primary reason is their age difference: Francis was approaching 30 when Clare was just growing into womanhood. Considering the times, I doubt such an age difference was unusual. I think the unspoken reason is that orthodox Catholics instinctively protect the pedestals upon which we place our saints -- even when no sin is suggested. And this is an important point, for Murray consistently insists upon their fidelity to Christian moral law, that is after Francis abandoned his old ways. More interesting, though, is how Francis seeking to fulfill his human yearning for love in Clare was not a distraction from his vocation, but paved the path towards taking Lady Poverty as his bride. It's not like Francis was setting out to found a religious order. He had no idea how he would shape the world 800 years after his death. He knew his need for a sensual, romantic love: His arms embraced a leper and his hands repaired a dilapidated church. And in the midst of those confusing times, I find it quite believable (and to his credit) that he considered marrying Clare. How can a man cannot forgo marriage if he isn't prepared to marry? Speaking of rebuilding that church, we are all quite fond of how Francis initially misunderstood what Christ really meant: the rebuilding of a spiritual Church falling into ruins. Yet we don't doubt that the process of rebuilding a physical church did not serve some redemptive purpose. How much more could an initial misunderstanding about who he should love exclusively -- Clare or Lady Poverty -- bear fruit in ways unseen? It is also noteworthy that Clare never married. Speculation thought it is, I find some compelling reasons to consider how "what might have been" shaped what became. This biography dove more into Francis' struggles later in life that I had never heard about before. I couldn't help but think about Theology of the Body while reading this book. Certainly there is some truth to the notion that in seeking Divine Love the consideration of married love can prepare a person for celibate love. In our fallen nature, they strike us as incompatible opposites. In the heavenly marriage, they are soul mates. 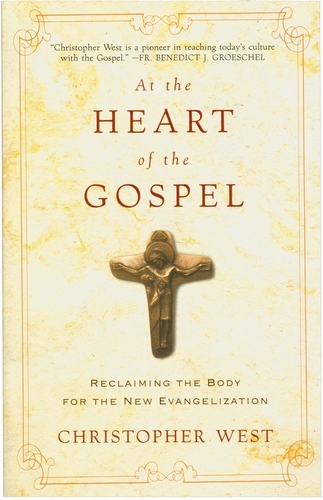 Thus, I think Christopher West's recently published, "At the Heart of the Gospel" might make the perfect follow-up read to "A Mended and Broken Heart."